Jaffna district Friday observed the eleventh death anniversary of LTTE senior commander Colonel Kittu and other nine LTTE cadres who sacrificed their lives on 15th January 1993 when the Indian Navy intercepted their vessel in the Indian Ocean. 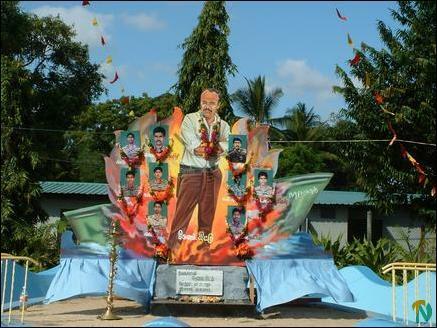 The main event was held Friday at Theeruvil Commemoration Square in Jaffna district, sources said. Earlier parents of LTTE martyrs were taken in a procession to the venue from Theeruvil junction with band music in attendance. Mr.Arunan, head of the Sea Tigers Kayts division, lit the flame of sacrifice. Thereafter LTTE Vadamaradchchi political head E.Thaya and Jaffna Civil Organizations Forum Mr. Solomon Cyril paid homage to dead LTTE cadres. The Thamileelam nation flag was hoisted by Jaffna district deputy political head of LTTE Mr. Semmanan and the monument erected in the remembrance of Colonel Kittu and other LTTE cadres was unveiled by Mannar district commander of the Sea Tigers Mr.Pahalavan. Death anniversary observance was held at the Kittu Poonga (Kittu park), which is located at Muththirai Santhi in Nallur in Jaffna town. A newly erected monument pillar replacing the destroyed one by the Sri Lanka Army was unveiled Friday at the Kittu Poonga. In Theeruvil also a newly erected monument pillar was unveiled, sources said.